The rotator cuff of the shoulder is a commonly injured muscle group, particularly in the older population.The rotator cuff comprises of a group of muscles; Infraspinatus, Supraspinatus, Teres Minor (formally functioning as the external rotators) and Subscapularis (the internal rotator). The rotator cuff tendons are particularly susceptible to degenerative injury, due to a lack of vascularity (blood supply). Other mechanisms or risk factor for rotator cuff injury are: poor scapular control, overuse, trauma, instability within the joint, impingement, anatomical abnormalities such as osteophytes, and capsular tightness or stiffness (Brukner & Khan, 2007). The most commonly injured rotator cuff tendon is supraspinatus (Kim et. Al., 2010). Symptoms can produce when raising the arm up from the side of the body or when carrying an overhead load. Supraspinatus injuries are best seen through medical imaging via Ultrasound. It is important to differentiate rotator cuff pathology from other potential diagnosis, such as sub-acromial impingement or bursitis, as it changes the focus of rehabilitation. However, it is not uncommon for both pathologies to be present together (Brukner & Khan, 2007). 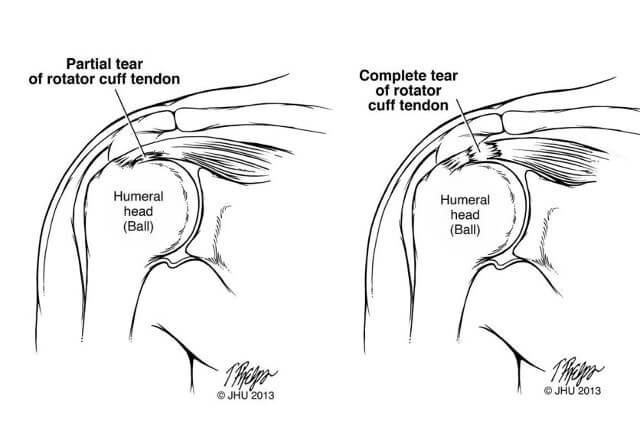 What is the difference between Partial and Full Rotator Cuff Tears? A partial tear goes only part of the way into the tendon. It’s usually described in terms of how deep the tear is in the tendon, doesn’t refer to the length, width or other dimensions. A full-thickness tear is when the wear in the tendon goes all the way through the tendon. Partial tears can be just 1 mm deep (only about 10 percent of a tendon) or it can be 50 percent or deeper. When a radiologist looks at an MRI scan, they must make a judgment about the type of the rotator cuff changes. They must decide if the changes are tendinosis, a partial tear or a full tear. – Despite the presence of a tear and/or tendinopathy, the rotator cuff muscles and tendons can be loaded gradually as tolerated. Even full thickness supraspinatus tears can become non-painful as the other external rotators are strengthened. – There is good evidence for conservative management of rotator cuff injuries, particularly in the older population (Lo et.al., 2018). – Complete rotator cuff tears are also best managed conservatively, OR prehab commences in preparation for surgery (Ryosa et.al., 2017). 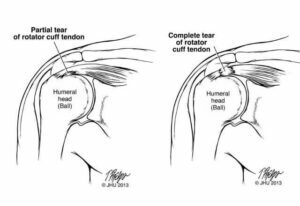 – In younger populations, acute rotator cuff injuries (particularly tears) may be managed surgically. This is determined by several factors however, including the time taken between the initial injury and the surgery. Often the tendon has shortened gradually over time, and when subjected to high loads (e.g. throwing sports) can rupture again. 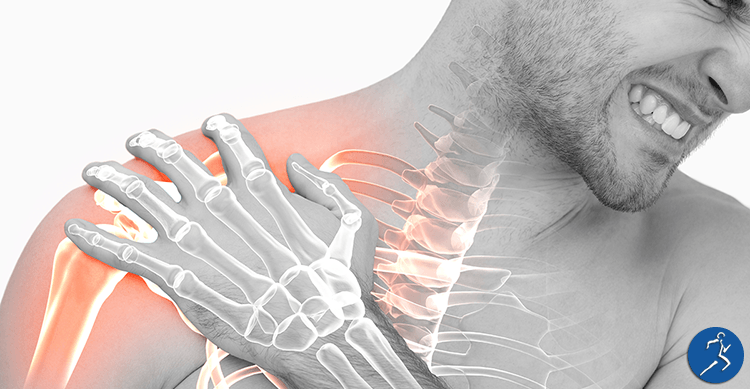 – Surgeries for rotator cuff injuries include tendon repairs, subacromial (joint) decompression, removal of bony spurs. – There is minimal evidence to suggest that cortico-steroid injections work for rotator cuff tendon injuries. – Other indications for surgery include unsuccessful conservative treatment of a duration of 6 weeks or greater (Saltychev et.al., 2014) (Lahdeoja, 2019). If you’re experiencing such symptoms, practitioners at MD Health can assess abnormalities within the shoulder. This is generally done through range of motion testing, along with special testing also. With this, we’re able to briefly assess via Ultrasound to gain a better understanding of the structure of the affected muscles and tendons. However, we are not able to diagnose using the ultrasound. If we notice any abnormalities present, we may find it beneficial to refer on to claim an MRI report for a formal diagnosis.